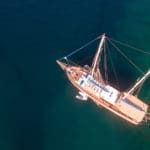 Have your heart set on a Turkish gulet cruise? You can enjoy the many destinations on a custom designed private gulet charter from anyone of the major harbors. There are many combinations in putting together an itinerary. One way gulet cruises are possible as well. An idea might be that you fly into the Milas airport, transfer to Bodrum harbor and then embark on your blue cruise holiday to Istanbul. Due to the distance involved, only a two week cruise would allow for this one way trip. However you can enjoy two or more weeks if you wish by extending the number of destinations visited along the way. A one way gulet charter from Bodrum to Istanbul, will later give you the opportunity to see the sights in Istanbul – should you have another week to spend on your holidays. While there are a variety of yachts to charter from Bodrum, determining which one is based on your budget, style and time of year. The reason we mention “time of year” is because of weather and sea conditions. During the months of July and August, the Meltemi winds are active in the Aegean sea. Traveling from Bodrum up north to Istanbul will place the winds against you. While you may think that maybe the trip should be in reverse, there are not too many, if any, yachts that will accept to travel from Istanbul to Bodrum in the peak season months – even if you do have the Meltemi behind you. 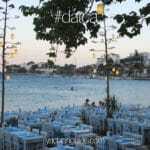 So which months might make for calmer waters in Bodrum and up towards the north? May, June, mid September and onward to October. Please Read All Conditions About this Trip Carefully to Make Sure it is for you. There are few things to keep in mind with this route. It is a very desirable route, but as you are heading upwards to the Northern Aegean, the sea conditions are different from the Mediterranean. The waters are cooler and may be a bit rougher. As such this trip in travel time for the guests is minimum 2 weeks long. Additionally there is the re-delivery of the boat back to Bodrum. 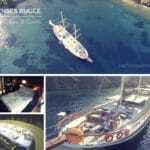 While some gulet owners charge an extra week for their empty return, others simply charge for the diesel cost. Therefore in total, the boat is reserved for 3 weeks. Gulet bookings revolve on Saturdays (start and finish). If the boat leaves Istanbul to head back to Bodrum, it needs time to get back in time for the following booking which starts on a Saturday – which during this time loses that possible one week booking just to get back to Bodrum for the next tour; hence the possible charge for the 3rd week. The destinations can be pre-established and re-evaluated during your travels depending on time, sea and weather conditions. The in-between stops for land excursions to historical sites also have to be taken into consideration with respect to the usage of time. You may stay in one place for 2 days and then move onto the next destination. There are Greek Islands along this route which you do have the option of visiting. The Greek Island harbor fees and taxes, plus customs fees are extra costs. How much these are cannot be determined exactly and only known once you arrive at any one particular island. As this is a long journey, a gulet no less than 30 meters is highly advisable – and that is minimum. More ideally, gulets from 32 meters and up are not only more comfortable, but also sturdier for such sea travels – especially in the Northern Aegean sea. Not available during high season months: mid June, July August, September. A personal tour guide can be hired for an added cost on a per day basis or full 2 weeks. This may be ideal for excursions on land to tell you about all the dozens of historical sites along the way. Charter rates start at 25,000 EUR per week. 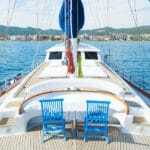 This is a private blue cruise charter holiday – and not a cabin charter shared cruise. Whether your group is 2 or more, the price of the charter remains the same. The only difference in price may be the cost of the menu which is calculated based on the number of passengers on the boat. There is no age limitation. The sea temperatures in the Southern Aegean are much warmer than the Northern Aegean. The waters may be colder once you pass Cesme. All land excursions are optional and an extra fee is payable to the providers. Your crew will assist you in booking a land excursion from whichever port you are in. Changes to the itinerary to visit the neighboring Greek Islands along the way, must be mutually agreed by your group and the captain. There are extra Greek Island harbor taxes and fees applicable. Greek Island visits for passenger counts above 12 is not possible due to the legality of insurance – which is a maximum of 12. This itinerary is a general guide and may vary according to client’s requirements. The route may also change based on weather conditions, at the discretion of the Captain.